Mother's Day cards were created by women from a variety of backgrounds. 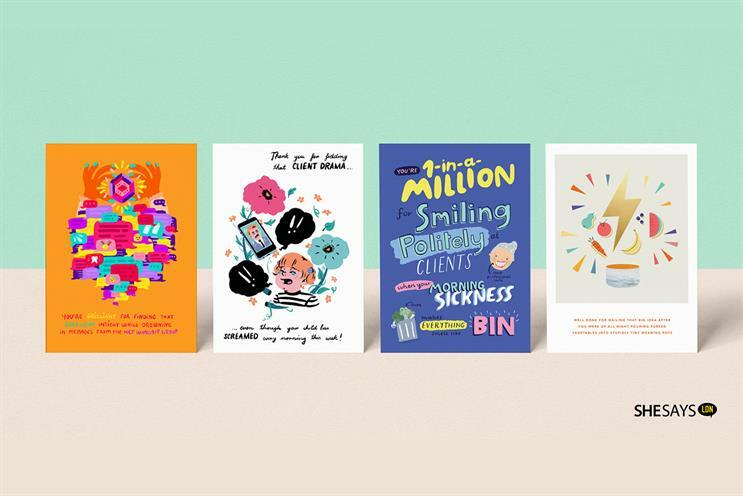 SheSays London is launching a range of Mother's Day cards to celebrate the mums in advertising successfully juggling work and parenting. Fabiana Xavier, president of SheSays London, said: "We want to commend the wonderful women working in advertising, while also inspire others to come back to the industry after having babies." The collection, called "Happy Multi-talented Mother’s Day", is the brainchild of senior creatives Lottie Marriner and Mikaela Rice. The playful and quirky cards use real insights gleaned from mothers in the industry, using female designers, illustrators and calligraphers from a variety of backgrounds. The creative strategy is to highlight mothers' skills in the workplace on a day when they are traditionally lauded for their parenting skills. Marriner said: "As a mum in the advertising industry, I’m only too aware of how precarious the juggle between meeting deadlines and making nursery pick-up can be. We felt very keenly the responsibility to make this respectful and authentic, and let other ad mums out there know what a great job they’re doing." The cards will be sold online here. They can also be found on SheSays London’s social pages under the hashtag #HappyAdMothersDay and #AdMums. Mother’s Day is on 31 March.